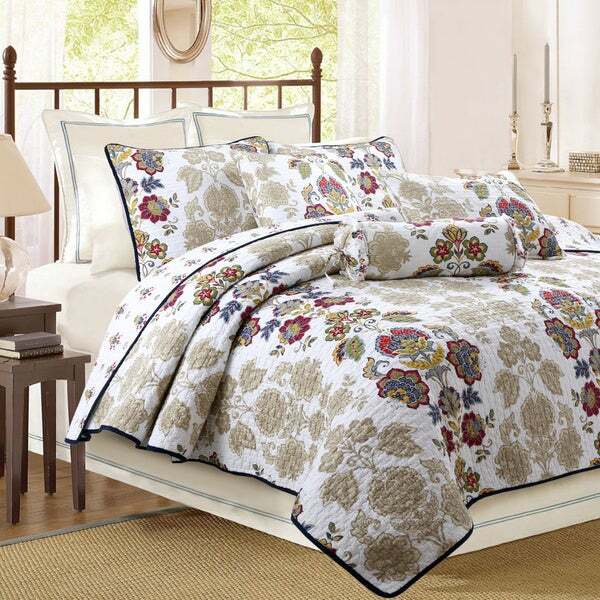 A mix of colorful floral print forms a unique pattern on this quilt set, making a beautiful addition to your room. This set is crafted of 100-percent cotton fora durable quality. It is conveniently machine washable. Beautiful quilt! Excellent quality! Unfortunately I have to return it because the color doesn’t look good with my Tommy Bahama bedroom set. I am very grateful and I think it makes my bed so cozy! Wonderful for people who live quilts but can't handle too much weight on feet or body from them at night. I love that it's cotton so I don't over heat! It will be perfect in the summer here in Arizona because it so light weight. Now for the winter it's perfect covering my old quilt I love but isn't pretty anymore. I recommend this!!!! Very nice quilt set! I am very pleased with the colors and how easy it was to wash/dry. I love this quilt! It is exactly what I wanted.